Three items of Viking silver dating back 1,000 years, discovered using a metal detector in the Isle of Man, has been declared treasure trove. An inquest heard the three silver pieces, found by Seth Crowe in a field in Andreas in April, date back to between 930 and 1080 AD. 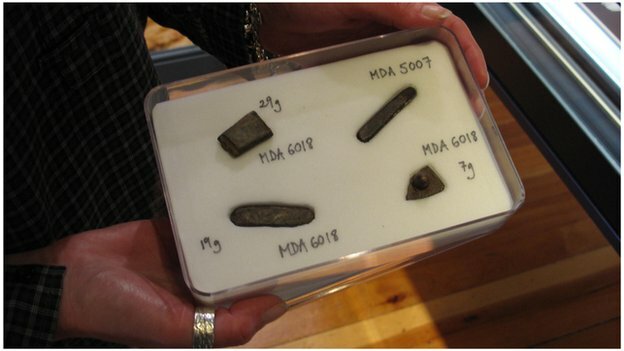 Archaeologists believe the two silver ingots and broach fragment contain more than 60% silver. The Ramsey man said he was “proud of his discovery”. All three objects were found in a ditch at the side of Mr Faragher’s field. It is the second significant find on the farmer’s land after fellow treasure seeker, John Crowe, found a similar Viking silver ingot in 2009. Head of Archaeology at Manx National Heritage, Allison Fox, said it is “highly likely” the two finds are related. 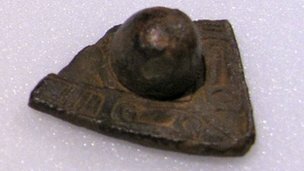 She explained there are no recorded archaeological sites near the area where the discovery was made and pieces like this are usually associated with larger hordes. According to Miss Fox, the ingots would have originally been used as currency. “They are another significant part of the Isle of Man’s amazing Viking history”, she said. The Vikings flourished on the Isle of Man and much of their influence is still evident today. She said: “This is the latest of a number of Viking finds in recent years and illustrates how the Isle of Man could have once acted as a ‘clearing house’ for deals in goods and wealth and been at the centre of Viking trade routes. After he made the discovery, Mr Crowe brought his find to the Manx Museum in Douglas. Following Wednesday’s ruling, MNH will now take a decision whether or not to acquire the items for the national collection. If that is the case they will be valued and a reward offered to the finder. Mr Crowe said any reward would be split 50-50 with the land owner.